This is Keck Observatory in Hawaii. 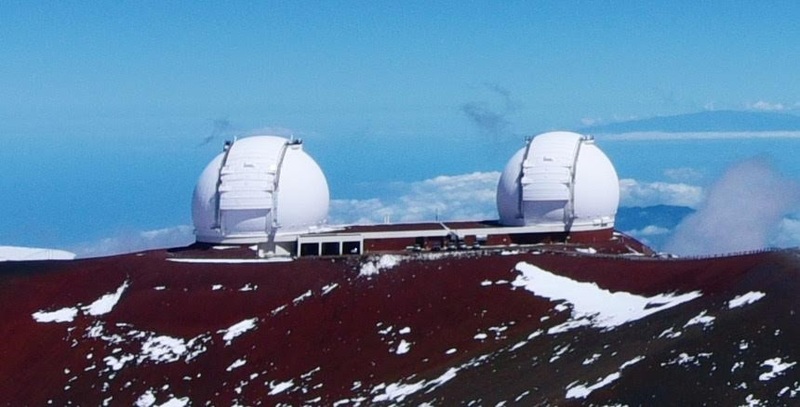 Under its twin domes are two very powerful telescopes. They are responsible for many astronomical discoveries including finding a great number of exoplanets, planets around distant stars. At this time (September 2018) astronomers confirmed the existence of 3,800 such planets and are further looking into additional 2,200 potential foreign planets. Because of our instrumental and observational limits, astronomers predominantly find uninhabitable planets similar to our Saturn or Jupiter, but smaller rocky planets similar to Earth were also discovered. The search for exoplanets remains a cutting edge science, and yet it is ever more obvious that a large proportion of stars are surrounded with planetary systems. Considering an enormous number of stars just in our own galaxy, it is almost certain there is life outside of Earth. While extraterrestrial life is almost certain, our chances of getting in contact with sentient beings are extremely slim. Distances between stars and planets are prohibitively enormous and cannot be circumvented. For instance all our electromagnetic signals from radios, TVs, telephones etc. traveling at the speed of light did not get further than to the few dozen nearest stars. We are almost certainly not alone in the universe, but in reality it is as if we really were! Notwithstanding theoretical nature of these realities they, nevertheless, raise some intriguing philosophical and theological questions. Join us this Sunday when we discern questions of Exoplanets and Faith. HR 8799 - the first directly observed extrasolar planetary system. This GIF animation was composed from Keck Observatory pictures. And a few additional notes. Anthropologists and even a number of governments felt the necessity to protect the so called uncontacted tribes specifically from zealous fundamentalist Christian missionaries who are known to cause more harm (physical, cultural and spiritual) rather than good to those whom they want to “save”. And furthermore, SciFi writers sometimes imagine a greatly advanced extraterrestrial civilization looking at our planet and our specie from a safe distance with a similar mixture of curiosity and desire not to intervene like we do with those uncontacted tribes. Well, we do not need to hyposticize any such extraterrestrial aliens any more. I know that the last few years our nearest neighbors and recent allies look at our national affairs and at our government with a similar mixture of curiosity, amusement and concern, not knowing what to do with the wild and irrational US administration.